AddressThe address for this sale in Traverse City, MI 49684 will be available after 9:00am on Wednesday, June 19th, 2019. Lake Leelanau, Traverse City, Michigan, Stop by browse & buy. Our Staff is friendly, knowledgeable and willing to help every customer. If needed we may limit the number of Patrons inside at one time @ our discretion. Cash, Credit Cards and Local Checks only with MI Driver License ID. Credit Card purchases with NO FEES. We welcome all to the sale, however Children must be supervised at all times and breakage is your responsibility. All Items sold AS IS with no Guarantees of any kind. Enter the Property at your own risk, we are not responsible for accidents or injury on the premises. Sales are final, No Refunds. Parking is available on the Road in front of the House. Please park safely & legally and do not block any driveways or road traffic. Handicap Parking is available close to the House. We will ALWAYS HELP BUYERS CARRY OUT & LOAD THEIR PURCASES. Local delivery service is available, fee varies. Longer distance hauling can be arranged at a higher fee. *****Please respect the privacy of the Family with NO Pre-Sales or Viewing, NO Early sales or Entry. 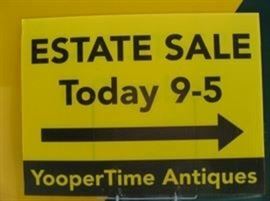 Watch for YELLOW YooperTime Antiques Estate Sale Signs. 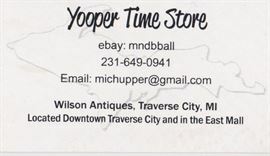 Sale Conducted by YooperTime Antiques and Estate Sales, Managers & Dealers at Wilsons Antiques East Bay, Williamston (Acme), MI.